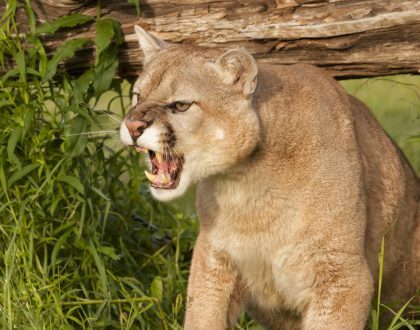 AUBURN, Ala. – We have seen them in movies and on the internet, but can we find mountain lions in Alabama? Commonly found in western parts of the United States, scientists say their range is expanding. 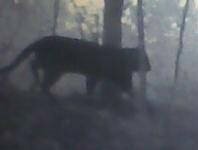 The most recent confirmed sighting nearest to Alabama happened September 2016 in Wayne County Tennessee. This county borders the north-western part of Alabama. 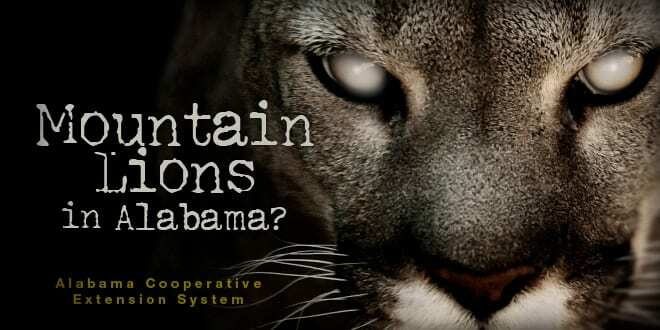 Does this mean there could be mountain lions in Alabama? Some seem to think so; others are skeptical. In 2015, a game camera photo amped up the conversation about mountain lions in Alabama. Theories and other assertions from the public quickly began to spread as the photo grew in popularity. So, is it possible for them to live in Alabama? Alabama Extension professionals try to answer this burning question. 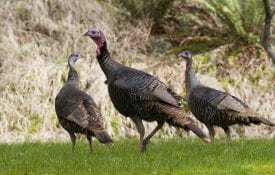 Spenser Bradley, an Alabama Extension regional agent covering forestry, wildlife and natural resources management, said confirmed sightings in Alabama are rare. “There are supposed sightings all the time, the problem is there haven’t been any actual confirmed sightings in a long time,” Bradley said. Regarding the image taken in 2015, he said the photo could easily be a house cat because there’s nothing to base the animal’s size on. 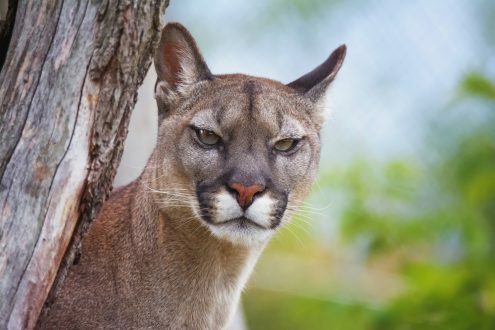 Dr. Jim Armstrong, an Alabama Extension wildlife specialist said there are usually 20 to 30 supposed mountain lion sightings a year in Alabama, though confirming evidence is lacking. 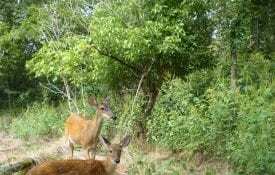 Captured by a deer camera in New Market, Ala.
Armstrong, who is also a professor at Auburn University, notes Alabama has a history of mountain lions because it is part of their natural range. Mountain lions, also called cougars, panthers or pumas, had a thriving population in Alabama in the 1800s and early 1900s. Today mountain lions are prospering in the western U.S., especially in California and Arizona. But the species has made its way back into states where they were previously extinct, the closest being Missouri, Tennessee and Florida. According to Armstrong, ironically the Eastern cougar has just been declared extinct by the U.S. Fish and Wildlife Service. 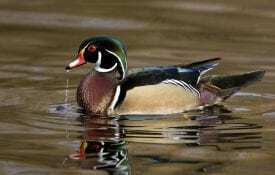 It is ironic in that many researchers believe that subspecies has been extinct since the early 1970s. One sure way to identify a mountain lion is through its prints. Mountain lion prints are generally 4 inches across, with three distinct lobes on the pads. Bradley said that there are calls all the time about prints that are large enough to be from a mountain lion, however they show claw marks. Depending on the geographical area, these animals can weigh anywhere from 80 to 200 pounds. Armstrong said that identification can be assisted by this animal’s habit with its prey. According to Armstrong, mountain lions tend to be secretive and quick. “For the most part we’re not talking about anything that’s a significant threat to humans, especially with the low populations like we have in the eastern U.S.,” Armstrong said. Armstrong’s views align with Bradley’s. But he points out that there are no absolutes with wildlife. There can always be an exception. Unprovoked, uninvited attacks on humans do happen, but they are rare. Most of the time, it is human activity that leads to instances with wild animals. Spenser Bradley along with his colleague Norm Haley, an Alabama Extension regional agent covering forestry, wildlife and natural resource management, created a three-part series of videos on gathering evidence to confirm cougars in Alabama. “It is possible that we could have a real sighting in Alabama in the future, and this is how to prove and confirm a sighting,” Bradley said.